I am pretty excited that Ash Wednesday coincides with Valentine's Day! Just in case we didn't get it: LENT! IT'S ALL ABOUT LOVE!! This is the first time this has happened in my lifetime, although, according to Google, it will happen again in 2024. I like Lent anyway, mostly because I love (and need) second chances. 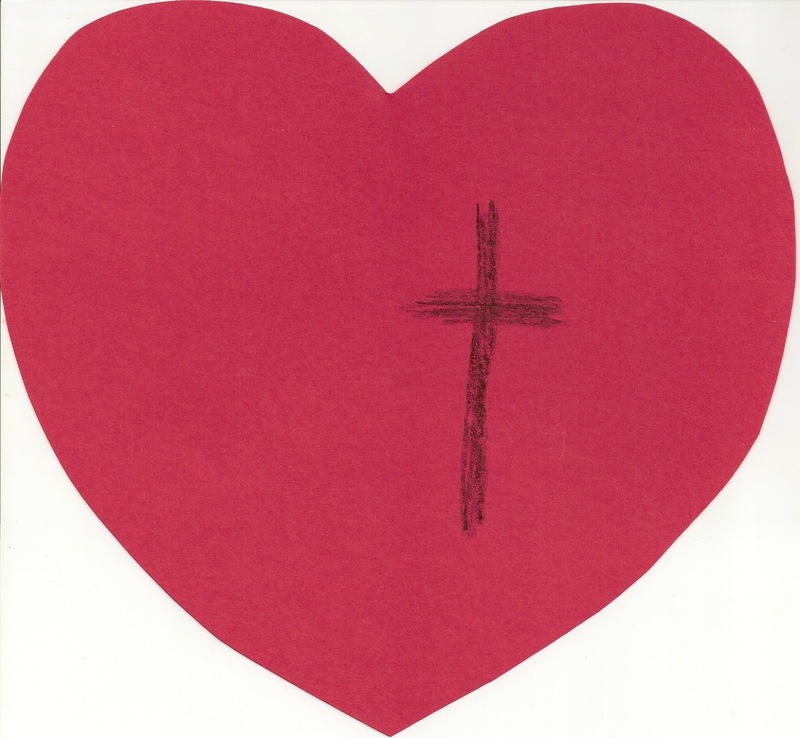 I feel like this Lent is a Valentine from God! I'm looking forward to new ways of seeing how God is loving me, and finding new ways to love God! Here is this year's Walking With Jesus Poster. This is essentially a Lenten calendar with a footstep for each day and a picture for each Sunday's Gospel. I think the foot steps are really hard to see, but they're there! And we are doing the Vine and Branches again. Basically it's a 7 foot tall vine cut out of brown paper with branches for each member of the family. We cut out tons of leaves and grapes and put them in a basket. Whenever anyone sees someone doing something good, they put a leaf or fruit on that person's branch. We'll be filling the cookie jar with pretzels instead of sweets, and we'll be only eating dessert on Sundays: Gospel Desserts! We'll be trying for daily Mass on Tuesdays and Thursdays, and we'll be collecting money (amongst ourselves) to donate to the poor. And we'll be doing the Scripture Cross. This is made of 40 squares of light purple paper. You do a scripture reading, have a kid draw a representation of the reading on a square, and then tape the square to a wall. By Easter you have a large cross representing Salvation History. We've done this several times and the kids loved it. You can find the readings and more info here. And the Sacrifice Beans. We put in a bean for each act of love or devotion. On Easter the beans become jelly beans because Jesus makes all our sacrifices sweet! And we've set up our little Lent Altar in our main room. This year we have the big wooden cross, a jar of ashes (from burning last year's palms), the squares for the Scripture Cross and the grapes and leaves for the vine, a candle, and a statue of Jesus on the way to the cross. I think for myself, the focus is going to be on reading more scripture, looking to better understand God's heart. I enjoy reading about your ideas for Lent! I've been so tired the last couple of Lents that I need inspiration to get back into all those activities for the children.